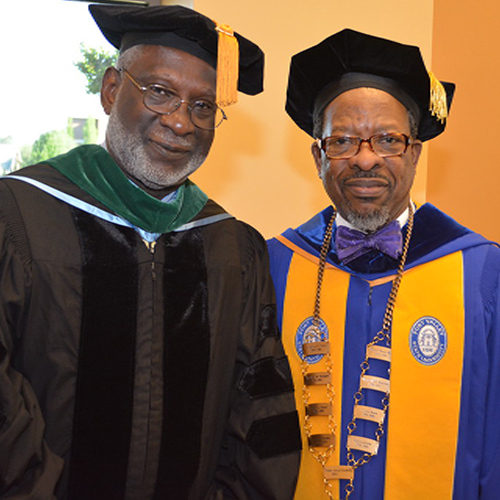 May 2, 2015 – Dr. David Satcher, the former surgeon general for the United States, talked to students about balancing their lives and learning about leadership during his keynote address at Fort Valley State University’s 74th annual spring commencement ceremony held May 2 in the Health and Physical Education Complex. This year more than 320 students received their degrees. “I’ve learned the prescription that will help you lead a balanced life,” Dr. Satcher told graduates. Before Satcher’s speech, the morning started off festive with a standing-room only crowd. As graduating Wildcat students marched into the HPE Complex, there was a collective roar from the audience. Parents and well wishers cheered and screamed their favorite graduate’s name as they marched on to the floor. “Good morning ladies and gentleman, welcome to the 2015 Spring Commencement,” said Dr. Jessica Bailey, FVSU provost and vice president for academic affairs. “Graduation is a solemn and auspicious occasion, but graduates it is your time.” In a new tradition, university officials paused at the beginning of the ceremony as blared music to allow graduates to dance and publicly celebrate their milestone accomplishments. Co-valedictorian Samantha “Starr” McCrory recited an inspirational poem for her fellow graduates. McCrory’s poems reminded students that although some hearts may be cold, students were servers of their communities. “We are leaders, we are bold, we are loved,” McCrory told her fellow FVSU graduates, before the National Anthem and the Lift Every Voice and Sing was recited by the audience. Dr. Ivelaw Lloyd Griffith, president of FVSU, gave the audience a profile of this year’s graduating class. Griffith gave special recognition to Yasmine Myers, a fifth-generation FVSU graduate and applauded James Linder, a 62-year-old graduate, who completed his undergraduate journey 44 years after starting his FVSU degree. Celebrating his achievement was his family and his 104-year-old grandmother who also attended the ceremony. Later, the president recognized Jasmine Taylor, a graduating senior, who was celebrating her birthday. Before offering her valedictorian speech, Ashley Davis was also recognized for her achievements, including being honored at the University System of Georgia’s Academic Recognition Award for 2015. Davis, a perfect 4.0 scholar, also served as a SGA officer and a member of Alpha Kappa Alpha, Sorority Inc. Davis is the outgoing president for the National Society of Black Engineers Chapter on campus. “It is an honor to speak to you as your valedictorian,” David told fellow graduates before thanking all the people who helped her get here to day, including her parents, God, her siblings, friends, sorority and administrators and fellow scholars within the Cooperative Developmental Energy Program (CDEP). “Our ancestors have sacrificed 100 years for us to walk across this stage to get your diploma. You are not only a college graduate, but a graduate of the FVSU,” Davis said. The Hon. Sanford Bishop, (D-2nd District), said he was honored to introduce the keynote speaker Dr. David Satcher, who currently serves as director of the Satcher Health Leadership Institute at the Morehouse School of Medicine. Satcher is also the former director of the U.S. Centers for Disease Control and Prevention and served as the assistant Secretary for Health and the Surgeon General for the U. S. Department of Health and Human Services. As the U.S. Surgeon General, he released the first-ever Surgeon General’s reports on mental health, oral health, sexual health, and overweight and obesity. He is also the former president for Meherry Medical College and the recipient of the New York Academy of Medicine Lifetime Achievement Award. Satcher said valedictorian Ashley Davis was a good representation of FVSU’s graduating class. During his address to graduate, Satcher gave the audience a prescription for a balanced life that would help them to live a good life. He told attendees to participate in moderate physical activity daily, get good nutrition, avoid toxins, be responsible for sexual activity, and to get daily relaxation and treat the mental health seriously. Following his speech, Satcher was given an honorary award by Dr. Griffith. The FVSU president also presented a special award to special award to CDEP founder Dr. Isaac Crumbly for celebrating 50 years with the university and Fort Valley Mayor Barbara Williams presented a proclamation in Crumbly’s honor. Bailey introduced FVSU’s four college deans – Graduate Studies and Extended Education dean Dr. Rayton Sianjina; Agriculture, Family Sciences and Technology dean Dr. Govind Kannan, Arts and Sciences dean Dr. Uppinder Mehan, and College of Education dean Dr. Edward Hill. The deans presented their graduates to receive their diplomas. The audience gave impromptu celebrations as graduates walked across the stage to receive their degrees. Some danced, others shouted and held up their fists as they received their bachelor’s or master’s degrees. The commencement wrapped up with commissioning ceremony. For details, contact (478) 825-6319. To view commencement pictures, visit https://www.flickr.com/photos/fvsu1895 and http://fvsu.smugmug.com/ to view and purchase copies of additional photos online.